The practice of aikido and all the pleasure it brings has been part of his life since the age of 17. Since then he has continued learning thanks to great senseis, but also thanks to the multitude of partners who have helped him evolve on a daily basis. He received his black belt from Massimo Nicolaci di Villadorata. Further studies with Yamada sensei, Kanai sensei, Tamura sensei, Chiba sensei, Kono sensei and many others left their mark on him. More than forty years of practice and thirty five years of teaching has cultivated a real feeling of gratitude towards O’sensei, the founder of this admirable martial art and towards all the people who have kept it alive. Particularly towards Claude Berthiaume who Robert is proud to call a friend for more than forty years. 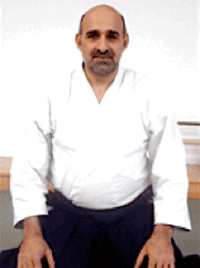 Robert Saad sensei received his title of Shihan on January 1st 2013 and the rank of 7th dan on January 1st 2014.